The Federal Government has kicked-off reconstruction of the 36-kilometre Ikorodu-Sagamu Road awarded to Messrs Arab Contractor O.A.O. Nigeria Limited at the cost of N20.845 billion. 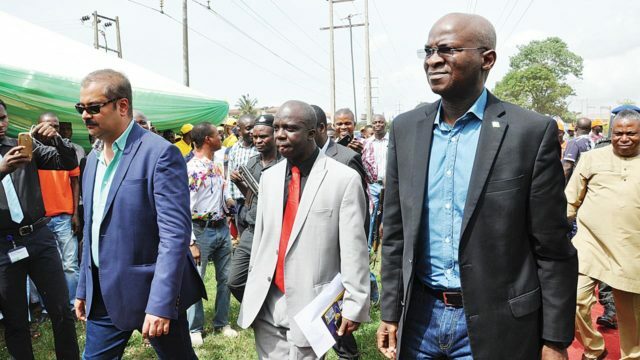 Minister of Power, Works and Housing, Mr. Babatunde Fashola (SAN), who performed the kick-off exercise yesterday, said the road would relieve the Ikorodu-Sagamu Expressway of traffic congestion and serve as an alternative route to the ever-busy Lagos-Ibadan Expressway, thereby improving the economic development of the country. Fashola, stressing the importance of the road at the ceremony witnessed by Senator Gbenga Ashafa, House of Representatives member, representing Ikorodu Central, Mr. Jimi Benson and Special Adviser to the President on Diaspora, Mrs. Abike Dabiri-Erewa, said the project had no political undertone but for the general use of Nigerians. According to him, politics is not enduring because it is always happening every four years, hence the need to focus on more enduring development. The minister, who warned politicians not to hijack the contract by excluding Nigerians from the benefit during the employment recruitment, assured the residents of government’s commitment to complete the job within the specified duration. In his address, Ashafa, who praised President Muhammadu Buhari for the gesture, said: “While I didn’t doubt the capability of the contractor in completing the project as scheduled, I urged the residents and road users to co-operate with the contractor in the course of executing the project. “Besides, we want to assure Lagosians that the project had already received the needed funds. So, the issue of project abandonment does not occur.”Also, the Director, Highways Construction and Rehabilitation, Dr. Femi Hamzat, said the project would improve the socio-economic life of the people and generate employment opportunity as well as help in the fight against armed robbery and other forms of crime in the area.